SCP-WLH series refers to the SCP products whose output type is welding. Its capacity range from 650F to 5600F. In order to improve the voltage class in use, these 2.7V ultracapacitors are usually connected with welding laser in serial or parallel. Compared with the traditional capacitor, ultra capacitor obtains its surface area from porous carbon electrode material, the porous structure of the material make the per gram weight of the surface area to thousands of square meters. And the distance separated by electric charge is determined by the size of the ionic in the electrolyte, which is less than one nanometer. As a result, the ultra capacitor with large surface area and a very small distance between charges, has far more capacitance than any conventional high-capacitance component of the same volume. 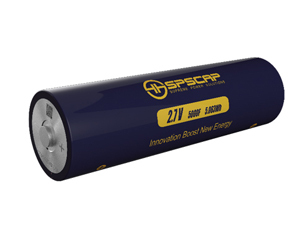 The SCP-WLH series supcaps have characteristics like high power density, high current with strong charge and discharge capability, long life cycle, etc., which could satisfy the requirements for vehicle to start up under low temperature, and their excellent power characteristics also give them incomparable advantages in locomotive engine startup system.